The fourth principle of Unitarian Universalism is to covenant together to affirm and promote the free and responsible search for truth and meaning. If you wonder what the truth is and what it means watch what people do; watch what I do. What kind of choices do I make? What kinds of actions do I engage in? If you are spiritually mature, you understand that you are a teacher of God by your example, the life you have created, the values you act on, the opinions, interpretations, and meanings you make and share. Actions speak louder than words and actions come from our beliefs about what it is we think we want to have happen. The pupils of the life course we teach have been assigned to us often by circumstances that we can't account for. They come into our lives because there is something they can learn from us and us from them. A person asked Mother Teresa, "Jesus said that the way to the kingdom is to love as I have loved and I wonder whom should I love?" Mother Teresa replied, "Love whomever Life puts in your path." Stephen Gaskin said one time that in the end all we have to offer another human being is our own state of existence. So what condition is your condition in? We need to be attentive to our own well being if we are to be of any help to anyone else. People should follow the airplane rule and put their own oxygen mask on first, then attend to the needs of others. Amen and as Kurt Vonnegut says, "So it goes......"
Vonnegut also said, We are what we pretend to be, so we must be careful about what we pretend to be. 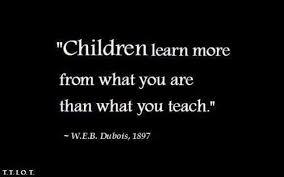 We teach what we want to learn. This is a common idea but not well recognized by most people. We have phrases like be careful what you wish for you might get it or be careful what you fear because you will attract it to yourself. It says in ACIM that we should ask ourselves, "What is the purpose of this relationship" and then go from there. A person is always teaching. There is no choice in that. Our life is our work of art, our lecture, our demonstration. I wonder, if we look closely, whether UUs teach something different in a more beneficial way than other people? It is pretty clear that parents pass their problems on to their children. If the parents are alcoholic or drug abusers there is a 40% greater chance than average their children will be. Same is true of depression, anxiety, physical and sexual abuse, etc. Parents can stop the abuse by being the buffer generation, the generation that stops the transgenerational transmission. It's a matter of awareness, choice, and practice. We are all called to lead exemplary lives if not for ourselves but for the people we come into contact with. A woman told me one time that people should go to church not for themselves but for the other people who come there.